Nick's Heroes: Phoenix police officer gives kids rides in real-life Batmobile! Our latest "Nick's Hero" got a BIG surprise at work! PHOENIX — Our latest "Nick's Hero" got a BIG surprise at work! Det. 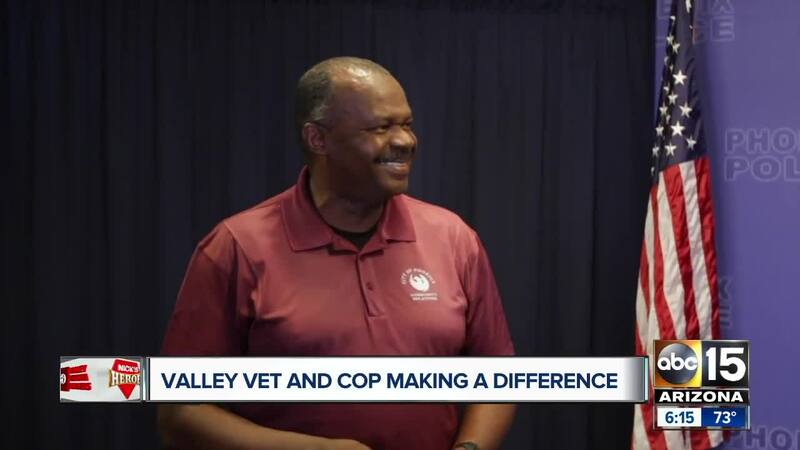 David Nicholson is a veteran and also works for the Phoenix Police Department. He thought everyone was meeting to take a squad photo, but it turns out, they all wanted to honor their fellow brother in blue. "He's an incredibly humble person, and he's an incredibly capable person and people really take to him because they can tell he has a genuine heart and cares about them," explains Sgt. Jamie Rothschild. And it's not just his co-workers who say this. Det. Nicholson volunteers with the Colton Cowell Foundation, giving rides to kids in a real-life Batmobile. Many of these kids are facing hard times, and sometimes, that means they're battling a debilitating disease. It's their chance to forget about the hard times and just be a kid for the day. "You can't believe the looks on their faces when they get to come to the cave, and they get to come to the cave, and they get to ride in the Batmobile, and you listen to them giggle," explains Det. Nicholson. All around us in the Valley, people go above and beyond to help make our community even better. We want to know who they are! Nominate someone today and tell us why they should be one of Nick's Heroes. They could win a $500 gift card from our friends at Valley Toyota Dealers.